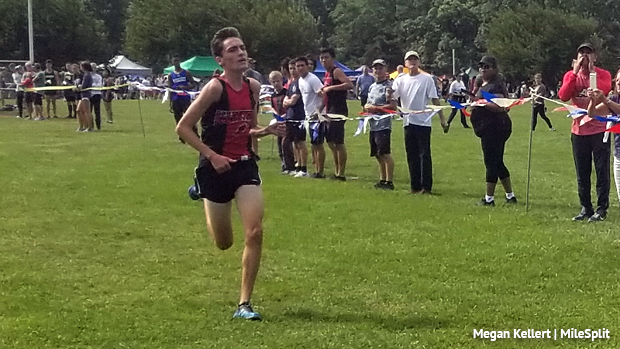 Juniors Liam Murphy of Allentown and Victoria Vanriele of Governor Livingston continued their torrid starts to the season, and the Hopewell Valley boys and Rumson girls had the top overall team performances at Saturday's Thompson Park Class Meet in Jamesburg, NJ. Murphy, who opened his season with a victory at the Cherokee Challenge two weeks ago, continued his remarkable rookie season on the trails when he won the Junior Boys 2 race in a meet record 15:39. Murphy, who won by 30 seconds, broke the meet record of 15:44 that had been set just 30 minutes earlier by Senior Division 2 winner Vedang Lad of West Windsor-Plainsboro North. Lad had broken the mark of 15:56 set in 2011 by Cullen Davis of North Brunswick. Hopewell Valley had the top boys team performance by averaging 17:16 and winning the merge, 107-169 over Manalapan. On the girls side, Vanriele, who has won four Meet of Champions titles in the 800 (two indoors and two outdoors), won the girls Junior Division title in 19:17, a second faster than Senior Division champion Lauren Wagner of Voorhees (19:18). In the team competition, Rumson defeated Freehold Township on the merge, 132-171. Rumson averaged 21:07.